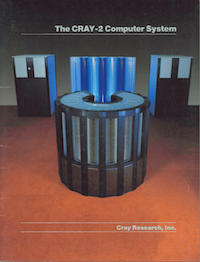 The CRAY - 2 Computer System sets the standards for the next generation of supercomputers. It is characterized by a large Common Memory (256 million 64-bit words), four Background Processors, a clock cycle of 4.1 nanoseconds (4.1 billionths of a second) and liquid immersion cooling. It offers effective throughput six to twelve times that of the CRAY-1 and runs an operating system based on the increasingly popular UNIXTM operating system. The CRAY - 2 Computer System uses the most advanced technology available. The compact mainframe is immersed in a fluorocarbon liquid that dissipates the heat generated on the densely packed electronic components. The logic and memory circuits are contained in eight-layer, three-dimensional modules. The large Common Memory is constructed of the most dense memory chips available, and the logic circuits are constructed from the fastest silicon chips available. The CRAY - 2 mainframe contains four independent Background Processors,each more powerful than a CRAY-1 computer. Featuring a clock cycle time of 4.1 nanoseconds - faster than any other computer system available - each of these processors offers exceptional scalar and vector processing capabilities. The four Background Processors can operate independently on separate jobs or concurrently on a single problem. The very high-speed Local Memory integral to each Background Processor is available for temporary storage of vector and scalar data. Common Memory is one of the most important features of the CRAY-2. It consists of 256 million 64-bit words randomly accessible from any of the four Background Processors and from any of the high-speed and common data channels. The memory is arranged in four quadrants with 128 interleaved banks. All memory access is performed automatically by the hardware. Any user may use all or part of this memory. In conventional memory-limited computer systems, I10 wait times for large problems that use out-of-memory storage run into hours.With the large Common Memory of the CRAY-2,many of these problems become CPU-bound.